In this irresistible beach read—perfect for fans of Jenny Han and Zoella’s Girl Online—America’s favorite pop goddess flees the spotlight to Maine to recover from her latest breakup. Only to fall head over heels for a down-to-earth local guy and be faced with an impossible decision: him or her music. Ah, September… that month of brilliant days and cool nights, of wide blue skies and golden haystacks, of blooming asters and changing leaves. Those of you who– like me– deign to call yourself students know that September means the official kickoff of the academic year, as if at some point during that post-Labour day rush the sands of time themselves haltingly resumed their flow, once again subject to the constraints of Deadlines and Commitments in the fading summer sun. But there are also those of you who– like me– lag behind the change in calendar, the stragglers who refuse to bid a perennial farewell to the dog days of heat and unchecked lazing, refuse to remove your oversized rose-tinted sunglasses, refuse to trade Fantasies and Sci-Fi’s and Contemporaries for that non-fiction gibberish of academia until the last possible moment. If you fit this criteria and are indeed on the lookout for that last epic summer weekend, Sing may be the concomitant novel for you. This newfangled gem by neoteric author Vivi Green is the literary embodiment of all things summer: beachy, star-studded, and dry as the high midsummer sun. 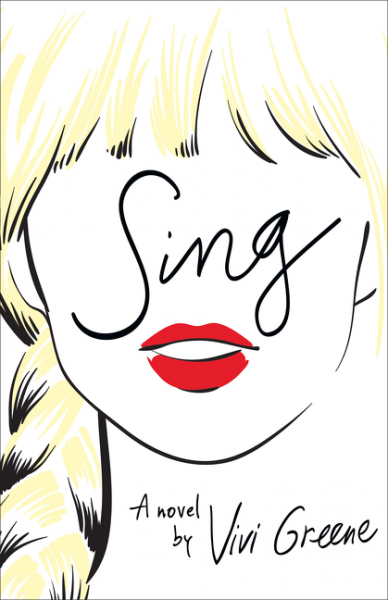 When I picked up Sing from my cherished local Target– 20% off the cover price! What fun!– I was anticipating the sweet, sentimental contemporary its blurb screamed. I was hoping for something sappy yet amusing, tired yet convivial, stereotyped yet worth every last penny. In other words: I was expecting a prototypal YA romance. I mean, if Jennifer E. Smith wrote six… it really shouldn’t be too much to ask. Never have I been so wrong. If anything, Sing was a chore to read– a far cry from the dreamy escape horse on which we all hedged bets. (Unless, of course, you prefer to vacation in bland woolly spaces, preoccupied by someone else’s processed melodrama and other such fabricated problems, in which case by all means read on.) The characters are relentlessly self-absorbed and wholly vapid, lifelong best friends who keep secrets and resent one another behind closed doors. The plot itself is simply boring. I remain unimpressed by the romance and unhappy with the bottom line. 2/5 stars– not terrible, but a disappointment nonetheless. In the eternal words of Sir Winston Churchill, Sing has all of the virtues I dislike and none of the vices I admire. Read at your own risk, and be warned– I expect no stupefaction when you find that this songbird is in fact dead in the water. Scarlett doesn’t remember anything before the age of four. Her parents say it’s from the trauma of seeing her house burn down, and she accepts the life they’ve created for her without question—until a car accident causes Scarlett to start remembering pieces of an unfamiliar past. Scarlett’s biological parents and their effulgent cult may indeed want her back, but I, for one, would be happy to never hear of her again. To put things simply, Awake was a a bad idea and waste of time. The writing is amateur; the plot is worst. Suspense kept it in motion until the halfway mark, at which point everything went downhill (as in, down the rabbit hole and into the territory of complete lunacy.) The storyline is problematic and dubitable; the peripeteia are painful and contrived. There is no question that the novel falls flat (as in, reading this book is the spiritual equivalent of falling flat on your face and suffering a particularly nasty ensuing traumatic brain injury.) In other words: avoid at all costs. Unfortunately, the novel’s ending condones this unorthodox romance– as if, because Noah has ultimately redeemed himself, the preface of their love becomes unimpeachable. No one mentions that Scarlett drove herself into an unhealthy position, that she made poor choices, fooled by pretty words and spruce profiles. No one mentions that she abandoned her friends for a comely boy, isolating herself from the remainder of her social life. No one mentions that their relationship hit a sizeable volume of red flags before cartwheeling into cult-inspired gibberish. To all young readers of Awake: this is not okay, and whatever you do, do not let Preston delude you into believing that it will somehow lead to a happy ending. 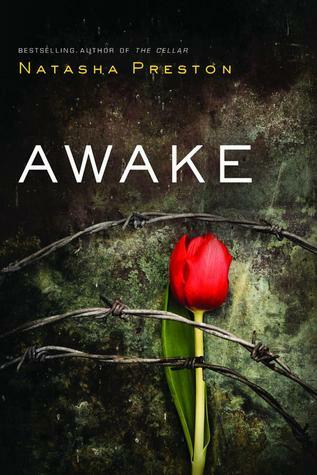 In a dazzling display of dynamic authorial skill, Awake works itself slowly but surely from a hesitant, vacillating thriller to a zealous, overwrought romance to a sheer, twenty-four carat fantasy over the course of its 314 pages. Based on preconceived notions of madmen and cults, this novel will have you questioning the constraints of reality (as well as the author’s credibility) in no time. One can safely assume that it was built on a plethora of misconceptions and zero research. Yes, dear readers, this is a thriller that tests the limits– the limits of my straining patience; the limits of widely accepted scientific knowledge; and the limits of one’s imagination, striving to envision a dubious plot in a disjointed reality. Evidently, I was viciously tempted to lay down arms, throw in the towel, drop Awake like a hot potato– scrawl Did Not Finish on its abortive gravestone and wash my hands of it, end of story, Rest in peace. Nevertheless, against all reason I plowed forward doggedly, my soul consumed by an omnipotent kind of morbid curiosity, a sickened fascination, utterly determined to authenticate the eventual veracity of my sinking suspicions. Needless to say my theories were corroborated, leading to clashing feelings of sharp disappointment and winded relief. Indeed, I would say that the ending was predictable had I not been so bafflingly unsure that any one person could so effectively string together such a laboured series of clichés in one physical space. Say what you will about Preston, but in any case she boggles the mind. All things considered, Natasha Preston’s latest will indeed keep you awake, be it with late-night binge-reading or bloodcurdling nightmares about late-night binge-reading. In the end, who’s to say? 0.4/5 stars. This is a story of knights in dull armour and sweet, vindictive maidens. A story of wolves in sheepskin; dragons with cherubic smiles, honeyed ringlets, wild eyes. A story of Orphans and Unforgivables and tiny saccharine strawberries devoured on the summer grass. Most of all, this is a story of pretty white lies and cracking white smiles, written as a gentle reminder to us cosmopolitans that we are all Heroes and Villains and Wolves. Wink Poppy Midnight is an unconventional thriller written in purple prose. Wink is an eccentric nobody. Poppy is a haughty bully. And Midnight is a beautiful boy caught between a rock and a hard place. When their respective threads tangle together beyond repair, these three striplings inadvertently rediscover not only each other but themselves. The three alternate narrators prove to be immensely confusing at first, so confusing that you’ll find yourself turning pages back and forth just to get your facts straight. The fundamental problem with the execution is this: these three distinct characters and personalities are written in precisely the same style, and therefore have precisely the same voice. However it is extremely difficult for me to work up sufficient energy to be bothered by this small hindrance, truly it is, because really this is my favourite kind of narration: the kind where you can’t extract the reality from the distortion and everyone lies. The truth becomes indeterminate when everybody fabricates their own personal illusions. 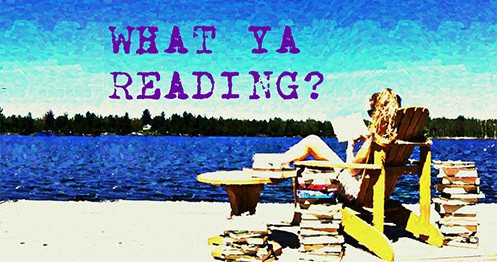 What’s the point in reading a thriller, anyway, if you don’t struggle to some degree at the outset? Tucholke’s writing is the foremost argument to read this book. It’s written like a fairy tale and a lullaby and a ballad all at once– three for the price of one. Although suffused with obscure literary references and countless key words in the triplicate– good things come in threes– not even these vitiations could dampen its lyrical beauty. (They could make you feel particularly inclined to bang your head against a brick wall on occasion, but that’s another story altogether.) Tucholke writes straight into your heart and doesn’t let go, until the timber of her words are the only reason you’re turning pages. I wasn’t built for missing things. I was built for winning and getting what I wanted and not for trying to be better, not for trying to be the best version of myself, it wasn’t working anyway, god, it wasn’t working at all. And I mean the only reason. The plot could have been better, to say the least. The paramount expanse of the novel consists of an unorthodox love triangle and Midnight’s multiple comparisons of Poppy’s creamy white skin vs. Wink’s freckles. It lagged frequently in the middle and the ending could have been so much bigger, better, shocking. It wasn’t a supreme letdown, per se, but it wasn’t a miracle or even an Event by anyone’s standards. It was only a moderate disappointment, a trifle of a washout blanching in the face of what might have been, if only this psychological thriller had been remotely thrilling. 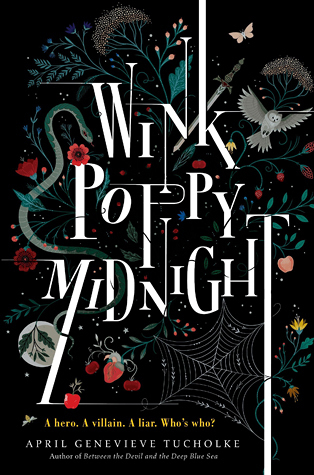 Therefore if you’re going to invest in the merger 247 pages that is Wink Poppy Midnight, I recommend that you read it all in one sitting– set aside a rainy Sunday or lazy summer afternoon and be done with it all in one fell swoop. Recommended to poets and artisans, liars and frauds. 2.9/5 stars. But Ignifex is not what Nyx expected. The strangely charming lord beguiles her, and his castle—a shifting maze of magical rooms—enthralls her. As Nyx searches for a way to free her homeland by uncovering Ignifex’s secrets, she finds herself unwillingly drawn to him. But even if she can bring herself to love her sworn enemy, how can she refuse her duty to kill him? 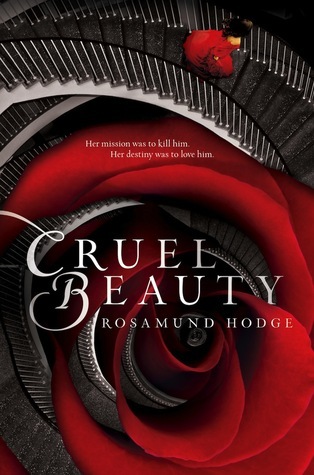 As far as retellings of Beauty and the Beast go, Cruel Beauty flourishes. (Perhaps unfairly, I have only A Court of Thorns and Roses with which to compare it, but in any case Hodge emerges victorious.) The traditional fairy tale is recast here in an entirely unique fantastical world, and yet somehow Hodge has indited it gracefully, seamlessly entwining Greek mythology with elements of that classic narrative we all know so well. Although the world building is sometimes halfhearted and feeble, the world itself remains bewitching. Gothic and sumptuous, it is the fairy tale setting we all may have known as children had Walt Disney given way to more Grecian Brothers Grimm. A belligerent revolutionary, Nyx is a colourfully authentic breath of fresh air in the world of YA. Like Ignifex, I like a girl with a little iniquity in her heart– Mary Sues can be so cloyingly tedious, can they not? Protagonists who are not everlastingly preoccupied with doing right until blue in the face always provide a much-needed interlude from the pervasive stodginess. Nyx, ever the individualist, is the proprietor of soul so fractured that it has effectively split down the middle; every facet of her nature, therefore, becomes antithetical to another. She is loving yet resentful, responsible yet reckless, noble yet a yellow-faced coward when it matters the most. This explicitly is why one trusts her from the very first page: she is flawed, and she knows it. The writing is standard. Although not particularly horrendous by any means, it’s no natural wonder of the world either– although it does have its own poetic moments, after a fashion. As for the plot, I’m still unsure if Cruel Beauty‘s ending is evidence of an elaborate loophole in the clause of the plot itself totally beyond the scope of my understanding, or merely an unimaginative deus ex machina meant to stun us and shut us up. I suppose we’ll never truly know. Regardless, it’s fast-paced, highly gripping, and packs one helluva twist. A big thanks goes to Rosamund Hodge for emerging onto the literary scene to give our dearest Tale as Old as Time a brand-new facelift. Belle always was one of my favourite Disney princesses, and Nyx just might live up to her reputation. Recommended to fans of revamped French fairy tales and walking paradoxes. 3.3/5 stars. In her latest novel, HarperTeen author Kiera Cass delves beyond her usual gowns, crowns and handsome royalty to bring you an exciting new twist on your favourite aquatic creatures. The Siren features a band of girls from various epochs serving their sentences as sirens under the care of the bloodthirsty Ocean. Indeed– this isn’t just any 99-year-old woman meets surfer dude kind of story. Regrettably, through Cass’s own personal authorial charm, its characters become harbingers of death not only to all imprudent mariners but also to anyone foolish enough to read their novel. Let us begin, therefore, with afore-mentioned centenarian: our protagonist. A hopeless romantic of wishy-washy character, Kahlen’s principal ambition in life is marriage. She has no burning passion for philanthropy or other such altruistic causes, no profound desire to achieve self-actualization, no fervent yearning to engage in any remote kind of vocation. She has no yearning at all, actually, save for tying the knot and pledging to devote the remainder of her years to that time-honoured tradition of holy matrimony. That is all. Now, when Henry David Thoreau advised us to Go Confidently in the Direction of our Dreams, I don’t believe that grand illusions of housewifery were quite the strain of aspirations that seized him, but then again we’ll never know. Perhaps he intended for all of his adherents to be rescued by their own respective prince charmings. You may be wondering, then, exactly who the lucky guy is to be so deserving of her perpetual adulation. The truth abides, however, that Kahlen has no such significant other in mind at the outset of The Siren. No, instead she pins the full extant of her hopes and dreams on a man whom she has never met. And that, ladies and gentleman, is taught helplessness: depending on a total stranger for your eventual happiness. And here– here exactly– in stripping her female lead of any self-sufficiency, any at all– is how Kiera Cass effectively voids any semblance of girl power excited by the notion of a powerful female myth. Fortunately for Kahlen, her painful lonesomeness is short-lived. Entering stage right and kick-starting our story’s action is Akinli, the new and improved take on the classic boy next door. Ever the trooper, Kahlen refuses to be intimidated or deterred by the constraints of her verbal communication, and lets this poor sucker get about three sentences in edgewise before the lovesick infatuation sets in. Nevertheless, the young couple is only able to engage in one episode of cake-baking before being tragically separated through their own fallacy. Needless to say, their connection was so heartfelt and tender that the very thought of never setting eyes on Akinli again sends Kahlen into a lasting depression. To me, this is not only dubious (sorry, Kahlen, but spending three hours with someone does in no way appoint him as your eternal lover– no, not even if he has shaggy blond hair and a violently outlandish first name) but also absolutely and grievously appalling. For that is the only true tragedy here: that a girl should throw away her very joie de vivre for such a fleeting moment. For that’s all Akinli should have been: a passing fling. The first male entity with whom Kahlen has had contact in roughly a century should in no way have been her one true love. Because honestly, if nailing down a guy with whom to bake a cake is all you need to fall head over heels, I don’t see why more of us aren’t abducting dashing young men in aprons and stockpiling on Pillsbury. In other words, as any good siren should know, there are other fish in the sea. Unfortunately for us, Cass misses her mark on nearly every other level of the novel as well. Her female supporting cast is recalcitrant and contrary, each character a one-dimensional variant of the other. The company includes our token harlot, creative soul, and brooding rebel. Furthermore, I’m not sure if the young East Indian girl introduced later on was meant to be progressive or theatrical, but either way she comes off as a caricature of her culture. Where Cass could have expounded on the theme of female friendship– which one would think might be implied given the presence of a siren sisterhood– she chose to isolate her protagonist from her comrades in what I can only assume is an effort to make her more misunderstood and special. The plot is no better. To put things simply, it revolves around dramatic lovelorn lamentations, a deus ex machina of a grand finale, and perhaps one appealing moment involving a notable Kafka short story. Sadly, even this Bohemian gem is not enough to redeem the plot as a whole from its own total vapidity. Although the sap award does in fact go to me for never being able to resist a seaside story in the summertime, Cass comes in a close second and owns every last inch of it. 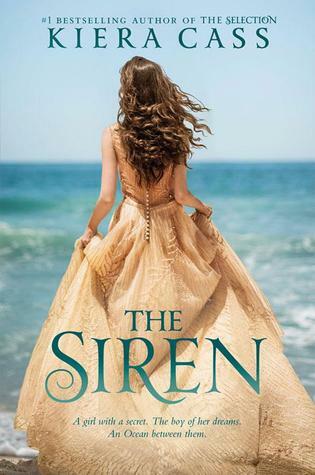 Hopelessly insipid and painfully romantic, The Siren reads like a bad Barbie movie– minus the Girls Can Do Anything tagline and the talking cats. 0.4/5 stars.